We hope that you will find this variety of directions, maps, and transport information useful, and that it will be helpful in enabling you to find your way to Crich Baptist Church, in Derbyshire. We can be found in the Market Place, right in the centre of this Derbyshire village. For friends who may not know where the county of Derbyshire is, to help you find us, it is situated almost right in the middle of England. The village of Crich itself is on the outskirts of the beautiful Peak District National Park, approximately 15 miles from Derby, and is located strategically between the Market towns of Matlock to the North, Wirksworth to the West, Alfreton to the East, with Ripley and Belper to the South. Crich is about 7 miles from junction 28 of the M1 motorway, and is also easily reached from the A6, A38 and A615. There is a ‘reasonable’ local bus service, and on-street parking near the church is usually quite adequate. The nearest major railway stations are at Derby, and at Chesterfield. Both are on the Midland main line, with trains travelling from London St. Pancras right up to Sheffield and Leeds. There is also a mainline service passing through nearby Alfreton. There are smaller country stations nearby at Whatstandwell, Ambergate, Cromford and Matlock. Services to these, whilst being better than nothing are somewhat infrequent. Check the relative train and other public transport timetables for details. 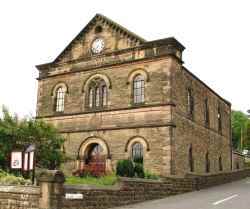 Should you ever be in the area you will always be very welcome to come to any of our services at Crich Baptist Church, in Derbyshire. If you need any further details, please do feel free to contact us we would love to hear from you. If you want to look at quite well detailed maps of Crich , or indeed Central Derbyshire, please click on the following links. To get greater advantage out of these maps, please note you can change your view of the area by using the pointers located on each page. I hope that you find this facility helpful. However, please don’t get so excited that you forget to come back……..and check out the rest of the site.